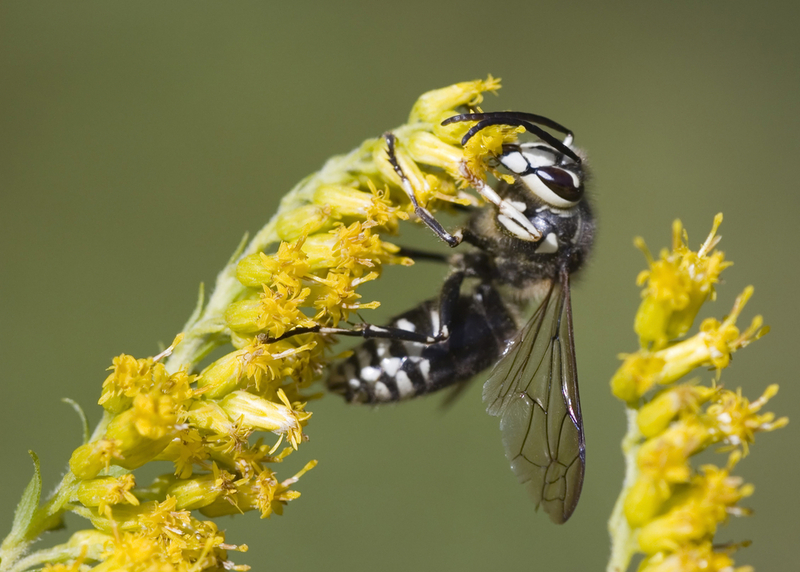 The bald-faced hornet is black with white or pale yellow markings. Bald-faced hornets are very beneficial because they capture other insects, of which their diet consists. Hornets will aggressively attack and sting any intruder threatening or disturbing the nest. This hornet constructs paper nests made from wood harvested from logs and trees. The nest of the bald-faced hornet will take on a football shape, growing larger with time. Some nests may measure up to two feet in length and contain hundreds of worker wasps. The nests remain active for about one year. 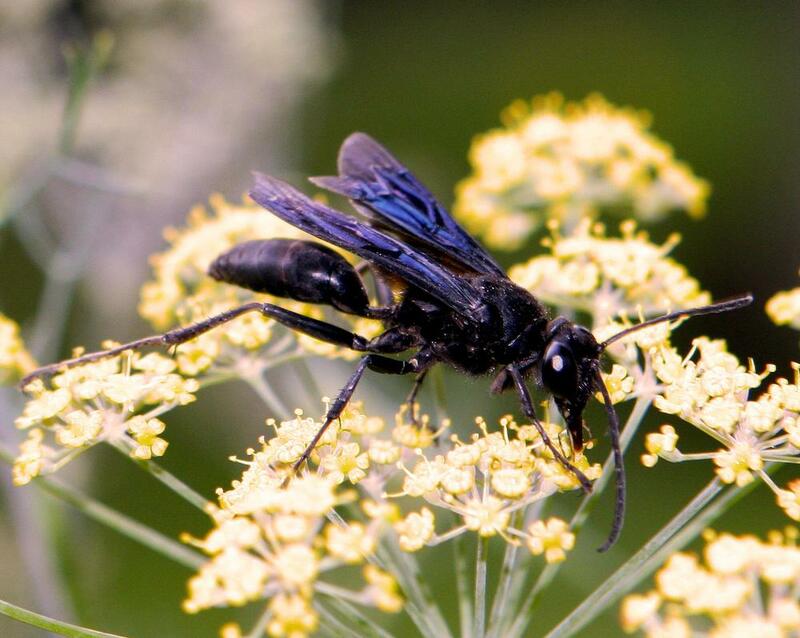 As its name implies, the black wasp is generally black in coloring but can be a dark blue-black as well. It is a large solitary non-aggressive wasp, up to 1 1/2 inches in length. Unless physically disturbed, they won’t behave aggressively, but once aggravated, they will sting. They usually nest in holes in the ground, but can nest elsewhere, such as in the hollow cavities of trees and houses. Coloring is usually black with yellow stripes on the thorax and abdomen. They have a hairy abdomen and are typically very short in length, only 1 inch in length. The colony grows larger over the summer and is usually discovered by a homeowner while gardening or mowing the lawn. The bees will attack to defend their nest, so they are considered a health concern. During the fall, the colony produces a number of queens that fly out to find protected sites to spend the winter and thus repeat the cycle next year. It is the workers forage on pollen and nectar for food. They also produce honey, but it is not edible to humans. 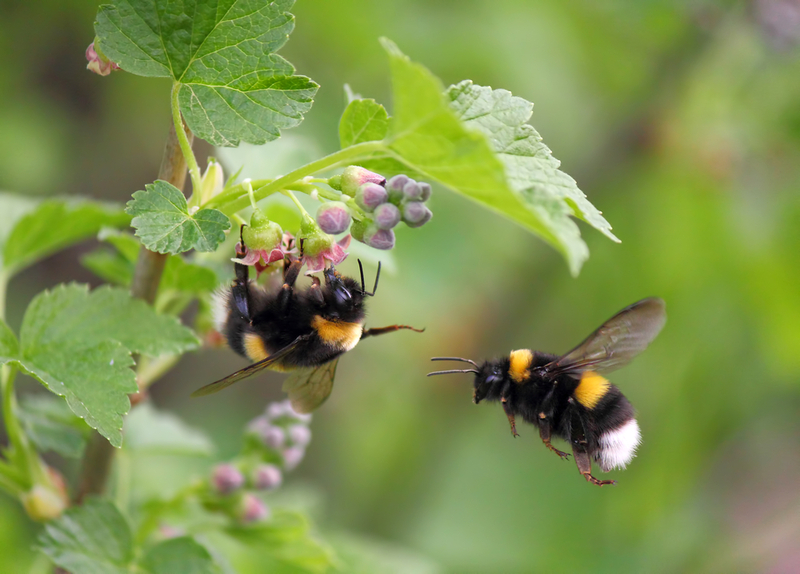 Bumblebees tend to live in colonies, in old rodent burrows, and other holes underground; however, bumblebees also establish nests above ground in walls, wood piles, sheds, and attics. Carpenter bees are fairly large, up to 1 inch in length. They resemble bumblebees except their abdomen is smooth and hairless. They make their nests, or “galleries,” in almost any wooden object available, which is where they get their name. They will also attack painted or stained wood. Male carpenter bees are very aggressive, but they have no stinger; females have a potent stinger, but seldom sting. Female carpenter bees make holes in wood in order to deposit their eggs. They will attack decks, siding, landscape timbers, and even lawn furniture. An infestation may be identified by the presence of wood shavings, much like what carpenter ants leave behind. With a long, mostly black, body, this wasp is noted for its size. Comparable in size to its prey, the cicada, the cicada killer wasp has pale yellow or white markings across its thorax and large brown wings. The females search tree trunks and lower limbs for cicadas. The wasp stings its prey, turns the victim on its back, and carries it back to the burrow where it is sealed with an egg to be eaten once the larva hatches. In spite of their large size, the wasps usually ignore people but they can give a painful sting if bothered. Mating males are aggressive and more easily disturbed. A mound of fine soil surrounds the burrow of each cicada killer. Since colonies of burrows are common, infested lawns usually contain several mounds that can smother the grass. However, they prefer to nest in areas of sparse vegetation. It is dark brown with yellow markings and usually nests in a hollow tree or log, or within buildings. Although it causes alarm because it is a large wasp and approaches lights at night, this wasp is not always aggressive. However, loud vibrating noises, such as those from lawnmowers and leaf blowers, can antagonize the hornet workers causing them to sting people and pets. Like bald-faced hornets, this hornet constructs aerial paper nests usually in trees and large shrubs. European hornets, however, will also nest inside the voids of buildings, usually in an attic or chimney. Nests may also be constructed on the sides of buildings. The nest is covered with a brown exterior of coarse wood fibers made from bits of wood scraped from logs, bark, and even the wood on decks and houses. This bee is bright golden yellow with dark brown bands of color across the thorax. Similar to the bumble bee, its abdomen is covered with hair, but its wings are much thinner in shape than the bumble bee. Honey bees live in large colonies led by a queen with a few male drones, and thousands of female workers. Like other stinging pests, honey bees behave defensively when threatened or feel the nest is in danger from intruders. However, they can only sting once and die soon after. Fortunately, for them, the pheromones released by a sting will signal other worker bees to attack. They are commonly discovered swarming around potential nest sites such as tree branches, logs, or buildings, or any flowering garden. While most active in the spring, a colony can survive without foraging for several years by living on food reserves and remaining packed in large groups in their nests through the winter. Mud daubers are solitary wasps with thin abdomens and wings. The most common species is black and yellow, but another is metallic blue with bluish wings. Mud daubers usually sting only when pinned against the skin. They are beneficial except for their unsightly mud nests, which often are placed around human habitation. The female wasp stocks the nest with insects or spiders that she has captured and stung into paralysis. After laying an egg on the prey, that cell is closed and she starts on the next cell. They build their nests in sheltered areas, often in trees, on porches, and near buildings. They are tube-like vertical cells positioned side by side. Paper wasps as distinguishable by a slender body variously colored with dark brown, red and yellow. 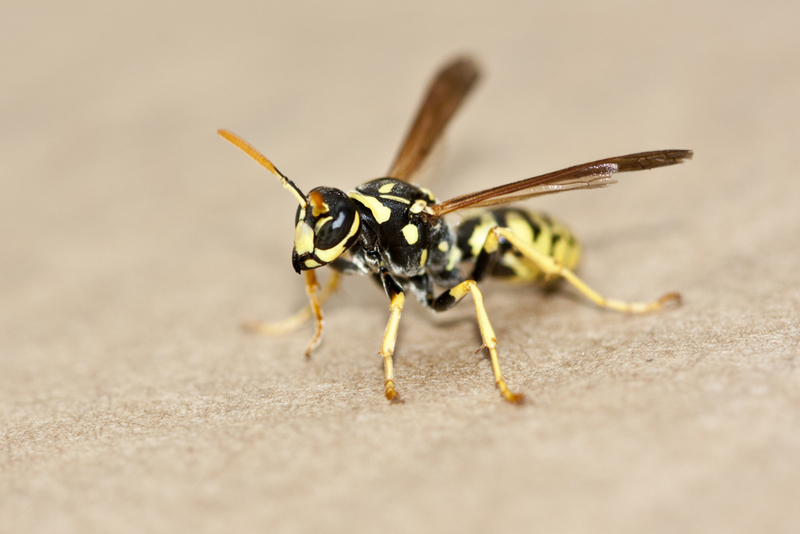 Paper wasps are not as aggressive as yellow jackets or hornets in defense of their nest. These nests should be eliminated only if they are located near human activity. Paper wasps are named as such due to their nests that are made from small wood or plant fibers combined with saliva and appear to be made from paper. These honeycomb-shaped nests are attached by a single stalk to horizontal surfaces as tree branches and the eaves of houses. Most yellow jackets are black and yellow, the reason for their name, although some may exhibit white and black coloration. In contrast to the bee, the yellow jacket's waist is thin and defined. Their elongated wings are as long as the body and fold laterally when at rest. Known to be aggressive defenders of their colonies, yellow jackets are otherwise not quick to sting. The sting of a yellow jacket is painful and each insect is capable of delivering multiple stings. Yellow jacket stings may induce severe allergic reactions in some individuals. Many yellow jackets are ground-nesters. Their colonies can be found under porches or steps, in sidewalk cracks, around railroad ties, or at the base of trees. However, some yellow jackets build nests in bushes or low-hanging branches or in the corners of buildings and other man-made structures.